Those after an all-in-one home entertainment package should look no further than this gas giant. The HD50 is a one stop media shop, comprising a 50in plasma TV (the PL5001), a Media Center PC, and a surround sound amplifier (the AM3100), all costing a cool £6,000. The HD50 isn't a new face in town. When originally launched two years ago, the admission fee was an astronomical £12,500, so the price slash represents terrific value for money if you're content to be spending four, rather than three, figure sums. This updated version now incorporates the manufacturer's new PL5001 flatscreen, and it smacks of sheer quality. The opulence begins with the HD50's solid build. The 50in plasma TV is built onto a robust floorstanding cabinet (available in a variety of colours). This houses the rest of the HD50's arsenal - Media Center PC, amplifier, subwoofer and optional centre speaker - and keeps everything out of sight. There's even a concealed section round the back that can hold a Sky receiver: Vivadi has thought of everything, it seems. Despite the strong start, the HD50 throws us a real curveball: it's not HD-ready, but only fails on a really minor point. To earn the HD-ready badge, HDMI and HD compatible component video inputs have to be ticked off, as well as the requisite resolution of 1366 x 768. Twin HDMIs are present and correct, but the HD50's component video jacks aren't HD compatible, so no HD-ready badge. We think this is nonsense, frankly: there are two HDMIs and a screen with the correct pixel count. Badge or no badge, the HD50 is an HDTV as far as we're concerned. 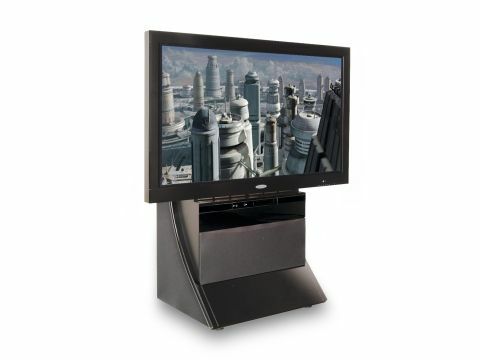 Most of the technological action takes place courtesy of the MG4100 Media Center PC. The feature count is fulsome, including twin digital tuners, 400GB HDD (making it an effective PVR), and Wi-Fi and Ethernet capabilities. There are also optional upgrades available, including a 1TB hard disk and an HD DVD or Blu-ray drive. All this sounds sensational on paper, but how does this TV fare in action? Like a superhero, that's how: standard and high definition pictures alike look spellbinding. Pictures from the Media Center's built-in digital tuners are top notch, oozing vibrancy and looking impressively realistic. Standard definition DVD images also look a treat, especially when delivered from an upscaling DVD player. Getting to the real meat, high definition footage allows the Saturn HD50 to reach for the stars. Our HD DVD test movie of Superman Returns appears suitably heroic in the loving arms of the HD50: images are clear as a bell, deliciously vibrant and supremely three dimensional. There's also strong audio support on offer. Optional speaker packages range from an affordable £500 to the more expensive £5,200 set up. For this review, we wrap our lug holes around the £3,000 package, and are suitably impressed with its 5.1 channel soundtrack performance: it's the perfect complement to the sensational imagery. The HD50's performance is up there with the best large screen plasmas we've had the pleasure to test. As an all-in-one solution to your home entertainment needs, it's in a class of its own.